Today we’re going to take a look at a recent report from ShareAction – a shareholder lobby group – which looks at the issue of Asset Manager Voting patterns not serving the best interests of shareholders. ShareAction (formerly known as FairPensions) is a charity that promotes responsible investment on behalf of individual shareholders as well as charities, faith groups and unions. The promote shareholder activism and the best use of voting at AGMs. 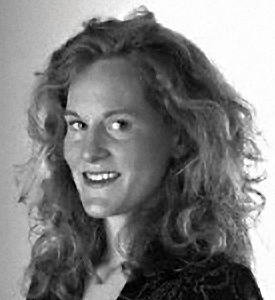 Their goal is to steer companies away from practices which they feel are “harmful to people and the environment” in order to bring about “a healthy planet and a fairer society”. The corporate “focus on profit must be balanced with social and environmental responsibility”. They back the campaign for the Living Wage. More practically, they train individuals to attend company AGMs and hold directors to account. They also lobby parliament and regulators. ShareAction is a charity, and amongst the donors listed on their website are other charities (Oxfam, Cafod, Christian Aid), environmental groups (Friends of the Earth, Greenpeace, World Wildlife fund) and trades unions (the Communication Workers Union, Prospect, the TSSA, UCU, Unison, Unite). A motley crew, but certainly a left-wing one. 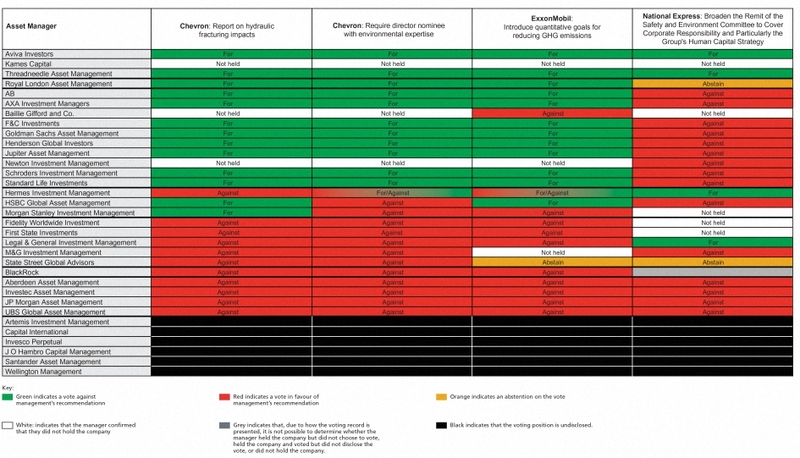 The report – Asset Manager Voting Practices: In Whose Interests? 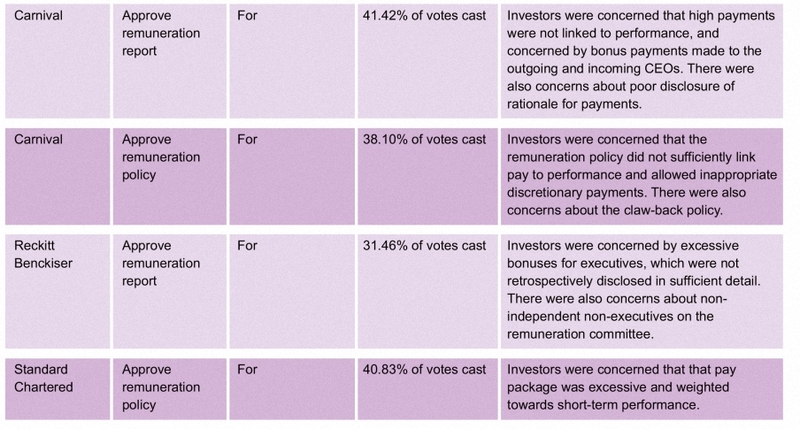 – looked at the voting records and levels of transparency of the largest 33 Asset Managers in the UK on what ShareAction described as “controversial” votes during a year’s worth of Annual General Meetings in 2014. This is ShareAction’s first survey to focus in detail on the asset management industry’s voting policies and practices. 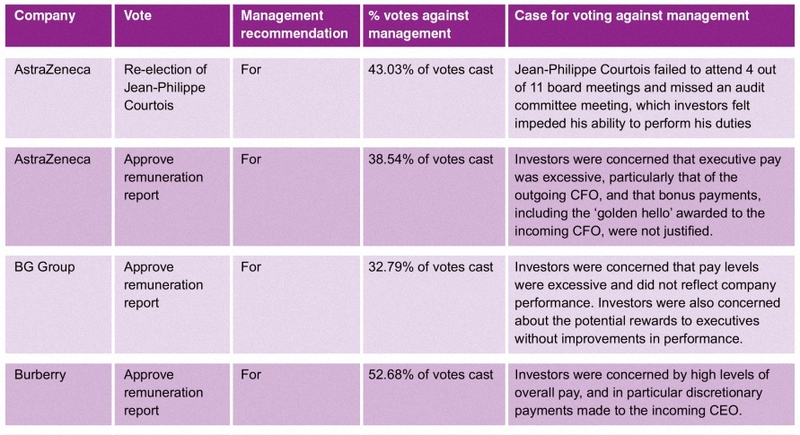 ShareAction defined controversial votes as a vote where the percentage of votes cast against management was greater than 30%, and where this shareholder revolt could not be attributed to the actions of one major shareholder.1 Most covered executive pay and re-electing board members. The report also examined four shareholder resolutions on environmental and social issues. The research was carried out between January 2015 and April 2015. During the analysis, asset managers were informed of their ranking by email and were given the opportunity to comment or ask questions, and to make additional disclosures or to provide clarification. 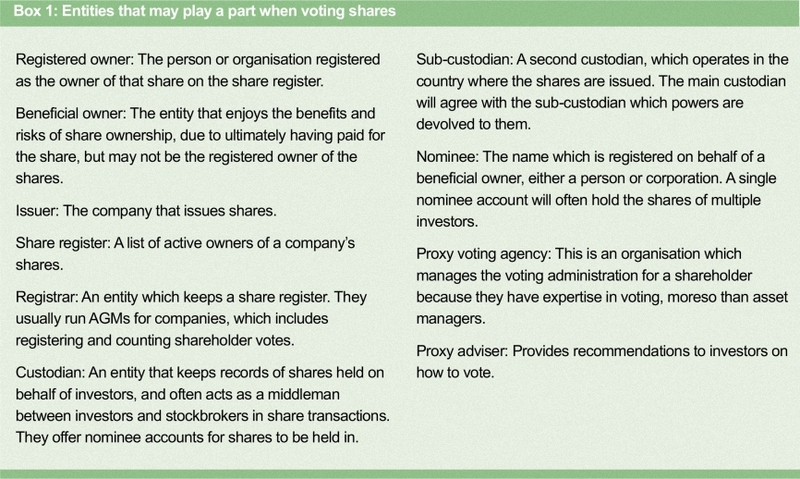 AGM voting is a key way for shareholders to exert influence over their investee companies. Trustees of pension funds and foundations need to act in the best interests of their beneficiaries. After the financial crisis, shareholders were given new voting powers over executive pay. The intention is reduce inappropriately large pay packages, and the focus on short-term performance. Companies now have to hold a binding vote on the directors’ remuneration policy at least every three years and an advisory vote on the directors’ remuneration report every year. If this advisory vote fails to pass, the company must hold a vote on the remuneration policy the following year. The asset management firms reviewed in the report are responsible for £13.8 trillion of global assets held on behalf of individual pensions, charities and universities. 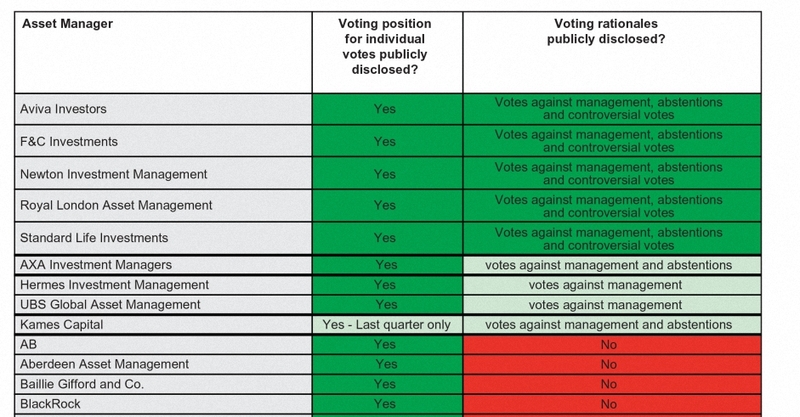 Asset Managers side too often with company management on controversial votes at company AGMs, even when there is a clear case for challenging company management on a vote. 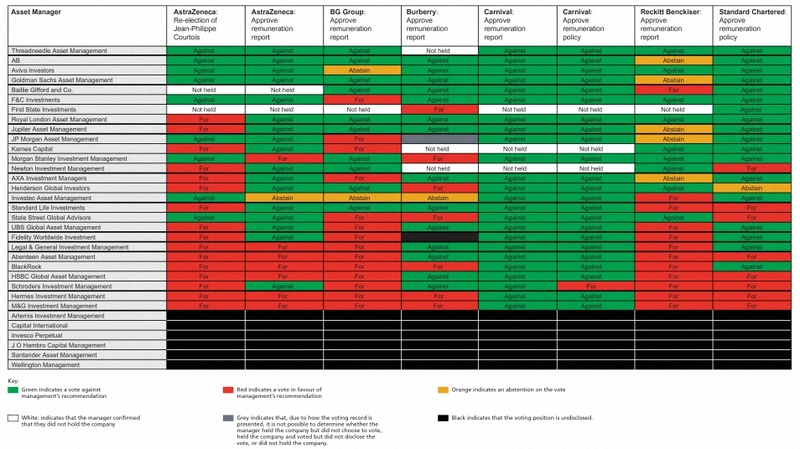 There is a disconnect between what some asset managers’ voting policies say they will do, and how they actually voted in 2014. Only a small number of managers disclose rationales for votes against management, or controversial votes with management, which hinders the ability of investors and other stakeholders to assess how managers make voting decisions and hold them to account. 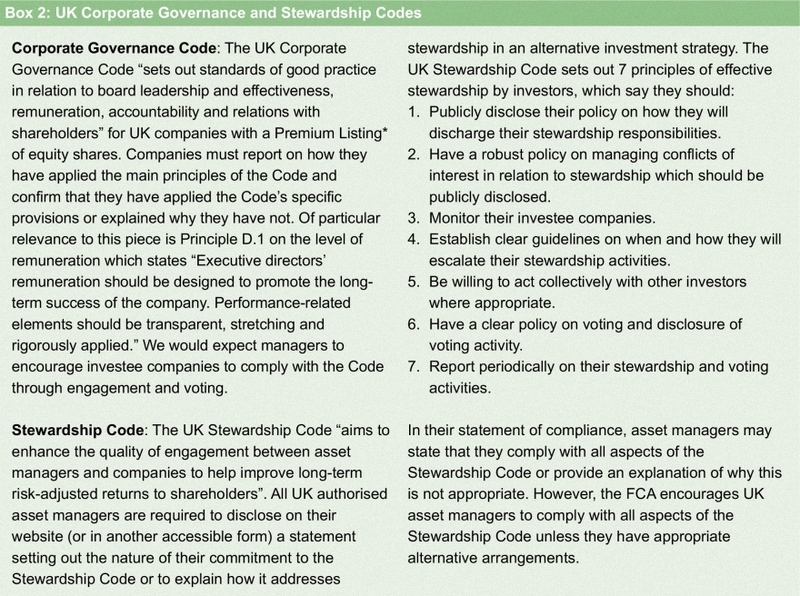 The Stewardship Code, to which all are signatories, recommends that asset managers should routinely disclose how they voted. 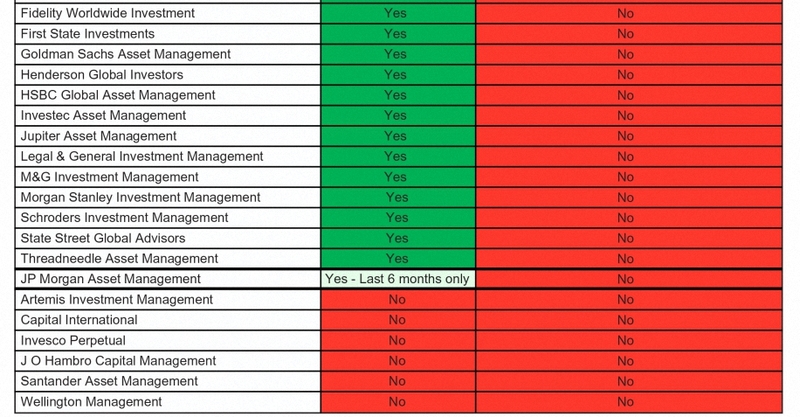 There is clearly an issue with asset managers supporting company management too easily. This will be more easily addressed through group action that by individuals, who are unlikely to boycott an Invesco Perpetual fund in favour of one from Aviva. ShareAction are coming at this problem from the social justice warrior (SJW) end of the spectrum, whereas I am more concerned about excessive executive remuneration and short-termism, but all hands to the pump.